I've said this before...but Eve takes the Best Aunt in the World award in my book. You might remember the jungle themed diaper cake she sent in a while ago. Absolutely amazing and jam packed full of gifts! This time around, she created an equally amazing diaper baby to go with a pack in play that she purchased for her niece. I've decided I want to be a part of Eve's family. :-) Thank you so much for sharing your diaper baby photos and ideas with us Eve! Fabulous job! This diaper baby gift is my second creation. I recently posted my first diaper cake. It was a jungle themed diaper cake. This time my niece is having a baby boy. So my daughters and I thought outside the box to create this Creation. My Niece had a portable bassinet/crib/changing station on her list of items. So we decided to make a diaper baby to fit her theme which was Turtles. 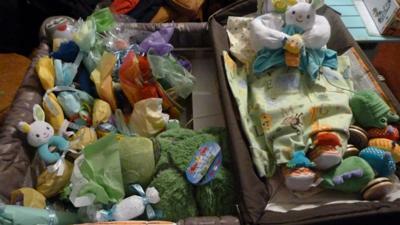 The crib was filled with all sorts of goodies from clothing, toys, bottles, and diapers. We wrapped up the clothes in tissue paper to make them look like party poppers. We made a diaper baby and placed him on the changing table. It was greatly appreciated by my niece. It was also a great way to pack up her other gifts to take home. I love this idea! My daughter is having a boy in June and I have been looking around for creative gifts to give her. One thing she really needs is a pack and play and I have been thinking of getting her one. Your idea is perfect as a gift. I can get her a pack and play and really dress it up with gifts and crafts. The diaper baby is precious! Thank you so much for your idea!